I’m a jigsaw puzzle fan. But, I’m a bit particular about my puzzles. I like photos rather than illustrations. It needs to be large enough to take awhile, but not so big that it takes up house space for weeks. It needs to be challenging, but not irritatingly so (those with great swathes of green hills or blue sky with all the pieces nearly identical, for example). I’m also a fan of puzzles in the classroom. Occasionally a jigsaw, but more often individual puzzles with letters or shapes. They don’t require content knowledge, but help to build a student’s willingness to try different things and stick to a task, even if they would prefer to find the solution instantly. I like to have them on hand as a fun but still useful filler. (Sarah Carter’s offerings at Math Equals Love blogare some favorites). 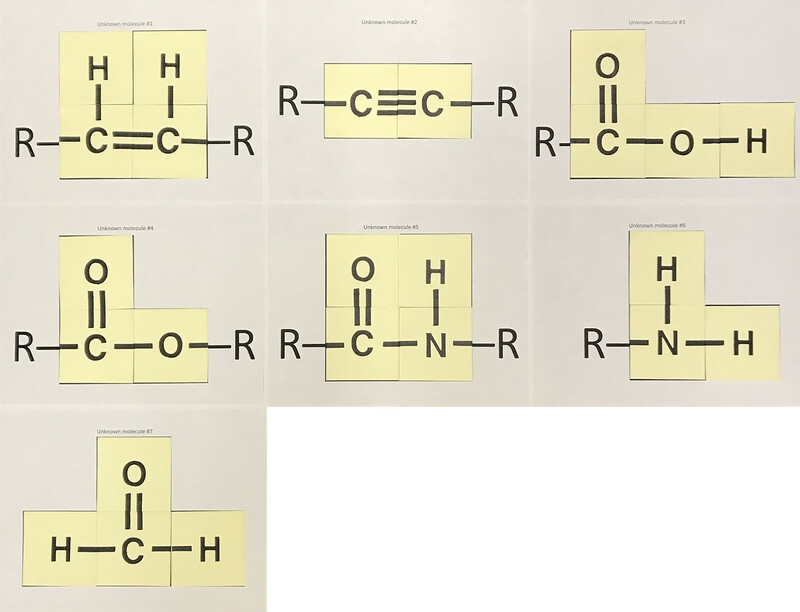 O’Halloran’s Puzzle to Build Organic Molecules with Sticky Notes (available to JCE subscribers*) is something I can add to the rotation, as a science-specific puzzle. Students each receive a sticky note with an element symbol and bonds extending from it. 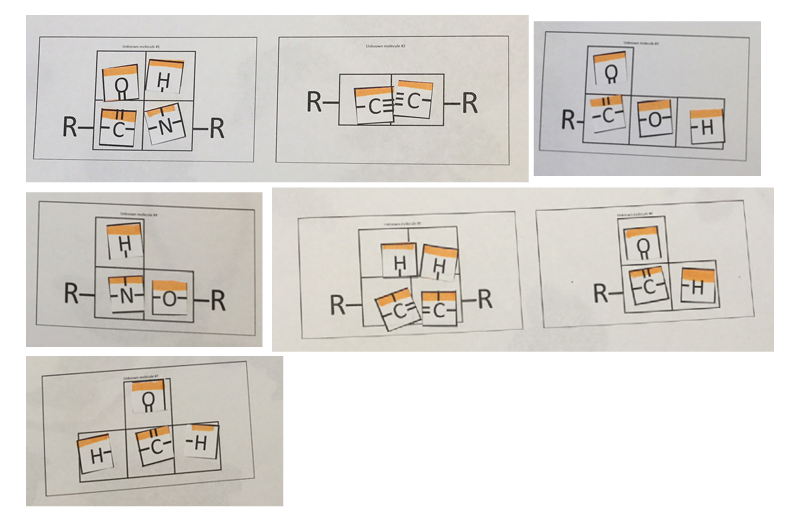 There are seven separate molecule templates to visit, and students work together to figure out the correct locations for the sticky note squares. The bonding must be chemically correct, and the sticky part of the square must remain at the top (no rotating). For example, one square shows a carbon with a single bond to the left and a triple bond to the right. That student knows to look for another triple bond. When I tested it, I chose not to use sticky notes. Other options would be cards (laminated if they will be reused) on a chalkboard or whiteboard with magnets to rearrange them, with the cards marked to show which side is the top. Figure 1: Reprinted with permission from Puzzle to Build Organic Molecules with Sticky Notes, Kevin P. O’Halloran. Journal of Chemical Education, 96 (4), 725-728. Copyright 2019 American Chemical Society. Figure 2: An additional “solution” that still follows activity guidelines (from this author). Although the puzzle does link to categories of organic compounds, it can be used even if students are not familiar with them. O’Halloran describes its use as “a good bridge between students learning Lewis dot diagrams in general chemistry and learning functional groups and classes of organic compounds in organic chemistry. … It can also be used as a primer before teaching these topics in class.” It makes students aware that there is a variety of organic compounds. Although the JCE keywords do not include high school, I could see using it there and even at the middle school level. In the American Chemical Society’s free Middle School Chemistrycurriculum that I use, it would fit at the end of chapter 4, after students use Lewis dot diagrams. Mary Saecker’s JCE 96.04 April 2019 Issue Highlights has a bonus this month. In addition to its usual unpacking of the latest Journal issue, she heads to the archives to share resources for April’s Chemists Celebrate Earth Week 2019 theme “Take Note: The Chemistry of Paper.” There are several JCE Classroom Activities in the list. With their use of materials from the grocery store and ready-to-use instructor and student handouts, they’re easy to use with classes or for outreach. I’m partial to Colorful Lather Printing. Even after having done it hundreds of times at Journal booths, the wonder and beauty of it never grows old.